Housing on Merit’s Executive Director, Jennifer Litwak, was honored to win the Gamechanger Award at the Women of Influence Awards on March 20. The Gamechanger Award recognizes women who make significant contributions to their industry with a track record of change, innovation and accomplishments. Ms. Litwak has successfully managed the closing of over $283 million in multifamily acquisitions, and overseen the development, preservation and renovation of over 2,500 affordable housing units nationwide. 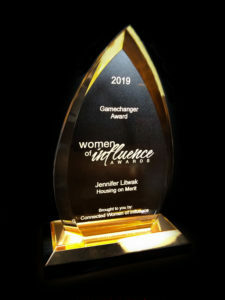 The awards ceremony was presented by the Connected Women of Influence Association in celebration of Women’s History Month and to recognize women leading the way in business, industry and enterprise, along with the organizations and individuals that champion women leaders.